SQL Injection occurs when data input for example by a user is interpreted as a SQL command rather than normal data by the backend database. This is an extremely common vulnerability and its successful exploitation can have critical implications. Netsparker confirmed the vulnerability by executing a test SQL Query on the back-end database. 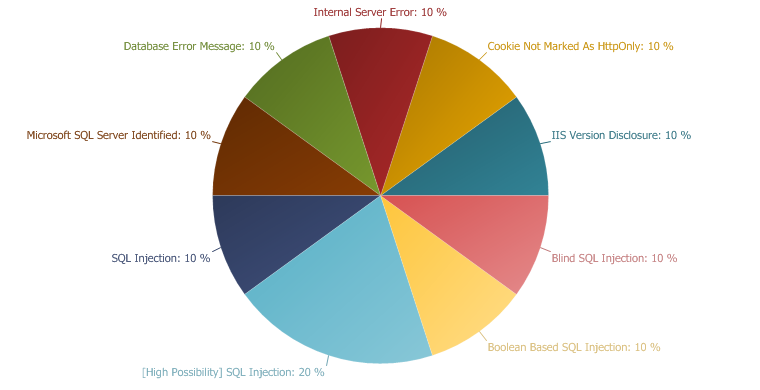 In these tests, SQL Injection was not obvious but the different responses from the page based on the injection test allowed Netsparker to identify and confirm the SQL Injection. The best way to protect your code against SQL Injections is using parameterised queries (prepared statements). Almost all modern languages provide built in libraries for this. Wherever possible do not create dynamic SQL queries or SQL queries with string concatenation. There are numerous freely available tools to exploit SQL Injection vulnerabilities. This is a complex area with many dependencies, however it should be noted that the numerous resources available in this area have raised both attacker awareness of the issues and their ability to discover and leverage them. // http://www.quirksmode.org/js/findpos.html# - much thanks.